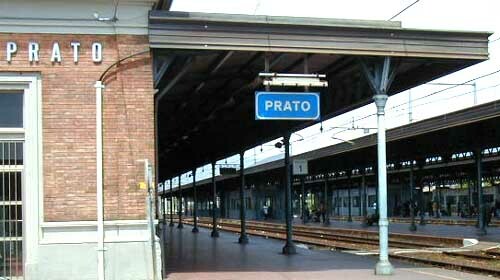 When you arrive in Prato by train, the first thing you see is ... the train station. And one of the first things you notice is that when it comes to freight trains the Praters - the residents of Prato - seem a little confused. I don't think they get out much. Most railroads carry freight by putting the freight into trucks, and then putting the trucks onto railroad flatcars. But Praters do it the other way around! And when it comes to passenger trains, well, not many Praters travel by train, they all seem to have Alfas.